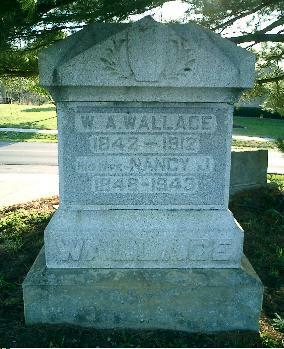 William A Wallace enrolled in the 17th Infantry on November 2, 1861. He was mustered in on January 4, 1862 at Calhoun for a three year enlistment in Company F. He was promoted from Corporal to Sergeant January 19th 1863. He was transferred to Company G April 12th, 1862 by General Order No 74, Dept Mississippi. He was discharged January 23, 1864 with his unit in Louisville. There were no other remarks in the Adjutant General's report.